Sensuel 30 is the slightly higher denier version of Oroblu's ever popular Sensuel 13 range. It is simply gorgeous and has so many exciting features. 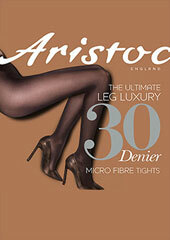 These tights are sheer to waist with flat seams and a cotton gusset for superb comfort. They are just as delicate and comfortable as their sheerer cousin, but with a little more robustness and a touch more coverage. Rating: 5 Absolutely my favorite pantyhose. They're comfortable and well-fitting, and the 30 den give my legs a lovely sheen while being quite durable as well. I not only wear them with my skirts and dresses, I've found that they're ideal to wear under slacks when the weather turns cooler too. The size chart seems a bit off to me - it calls for me to wear a large, but I've found the extra large to be just right. Rating: 5 These are my go to tights when inbetween seasons. Perfect for early autumn before the bitter wind sets in. Size medium is great for me at 5'7" & dress size 8-10.